This is a great tour for the first post of our official second year of operation! Heading back to northern New Jersey for our next store tour -- this blog is called NJ Supermarkets, anyway! We're here in Maplewood, which is a somewhat strange town. Maplewood's downtown is easily one of the most pleasant walking downtowns in northern New Jersey (well, okay, it wasn't the day I was there because most of the street and sidewalk was closed for sewer system maintenance, but other times...) and many neighborhoods are very affluent. There is a tiny Kings Food Market in downtown Maplewood, obviously catering to the more affluent clientele. However, Maplewood also borders Union (middle-class), Newark (a pretty nice neighborhood), and Irvington (a lower-income city with unfortunately one of the highest crime rates in the state). The neighborhood where Extra is located is right where Maplewood, Irvington, and Newark all meet. It's right where a nicer neighborhood meets a less-nice neighborhood. The Extra was probably built in the 1950s as a Good Deal Supermarket, which Sam Aidekman operated. (Sam's brother Alex was a co-founder of both Wakefern and Supermarkets General, which became Pathmark.) Good Deal, which may or may not have been affiliated with Wakefern, went out of business in 1976, at which point this store became a ShopRite, probably operated by Village Super Market. ShopRite was likely gone by the 1990s and Extra, a five-store independent chain, moved in soon after. 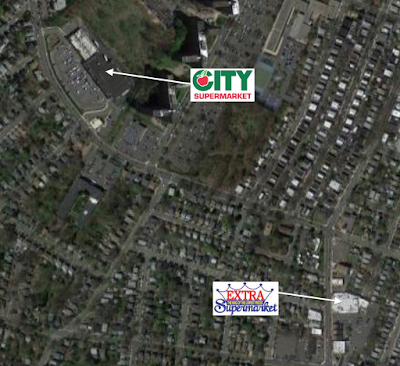 Right around the corner from Extra is City Supermarket, which we'll tour next Monday. Okay, so the exterior won't blow you away. Sure, there are about five distinct shades of red. And the building is a kind of sickly yellowish beige. But anyway the store is designed to face Irvington Ave, the street in front. The pictures are very nice. The building's color looks marginally better here. Not just low prices! However, the interior looks exponentially better than the outside. The interior is extremely clean and well-maintained, if a little on the older side. Seems to me the store was recently updated with new decor and a new paint job on the walls. Let's head in. You walk into a large produce department which strangely enough, does not take up any perimeter space. The left side is grocery shelves and the right side is meat cases. There's a service deli/butcher counter in the front and a large hot food bar, and a seafood department at the back. The signs are very simple but attractive. Looking back up towards the front. The entrance is right under the Extra logo on the right. Now that's a pile of greens! A good overview of the grand aisle. It's very bright and clean and although the fixtures and floor are old, they don't show much of their age. The seafood counter at the back of the grand aisle is pretty large for the store's size. The grocery aisles are pretty standard. I don't think you'll need glasses to read that Thank You sign. Not a huge fan of the aisle markers, but oh well. The rest of the store makes up for it. Dairy along the back wall. As I commented in my Mount Vernon Foodtown post, 100% recycled paper products are very hard to find. But this store had a few different brands! I can't explain that one. The aisle markers actually have 3-D elements which seem to be prone to falling off. #9 is missing its blue stripe on the left! The floors have to be newly refinished. They're clearly older but look like they could be brand-new. (I bet it's also a result of meticulous maintenance over the years.) And I don't mind the checkerboard because it's so faint. I also like how the diamond theme is repeated on the wall signs. Dairy corner, opposite the entrance on the back wall, of course. This store, like many older supermarkets, has the large curved security mirrors around, but also an updated camera system. Maybe I was just here on a good day (a weekday afternoon), but the shelves were all very well stocked. Look at those dairy cases! The last aisle, which is frozen foods. The left side cases look pretty new, but the open deck freezer cases on the right are clearly not! A look along the front-end. Customer service is behind all the Little Debbie! And again, you won't struggle to see the Thank You sign. This Extra was a real surprise for me. I knew more or less what the store looked like from online pictures, but it was much cleaner, brighter, and better-stocked than I imagined. Also all of the carts were brand-new and they all match (big points for that). So City has some tough competition. We'll be taking a look at City in a week!